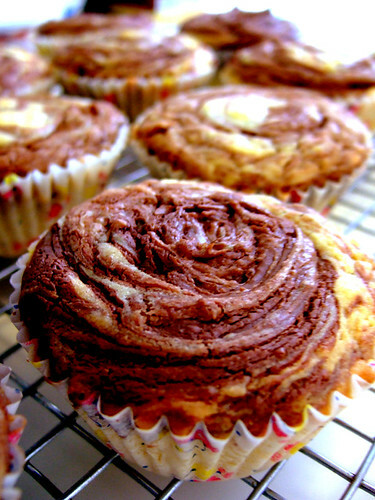 sukuen's Died-and-Went-to-Heaven Nutella Cupcake, originally uploaded by sukuenandtiny. Wow! Those dound (and look) so yummy!!! Do you have the recipe??? I would love to have it if you don't mind sharing!!!! Cream together butter and sugar until light, 2 minutes. Add in eggs one at a time, until fully incorporated. Don't worry if the batter doesn't look smooth. Add vanilla. Stir in flour, salt and baking powder until batter is uniform and no flour remains. Using an ice cream scoop, fill each muffin liner with batter. They should be 3/4 full, if you're not using a scoop. Top each cake with 1 1/2 tsp Nutella. Swirl Nutella in with a toothpick, making sure to fold a bit of batter up over the Nutella.